As President of Coastal Construction’s Central and North Florida Division, Sean DeMartino leads all business operations including acquisitions and administration. A widely respected industry veteran, DeMartino enjoys more than 30 years as a proven construction leader, heading a variety of mid and large scale projects spanning the hospitality, entertainment, corporate office, large public assembly, mixed use, multi-family, aviation, upper level education, and governmental sectors including clients such as Walt Disney, Universal Orlando, LYNX and the Orlando Magic. DeMartino’s efforts and expertise can be seen in some of the most significant and iconic structures in the region, including the Dr. Phillips Center for the Performing Arts, the Peabody Hotel (now the Hyatt Regency Orlando), and the Harris Corporate Headquarters and High Technology Center in Palm Bay, FL. In addition, DeMartino led the construction of projects in Hawaii and the Caribbean. 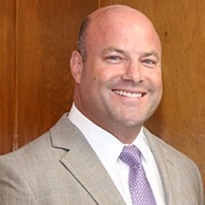 Active in civic circles, DeMartino is involved in a variety of professional and philanthropic organizations including Vice Chairman at Heart of Florida United Way, Junior Achievement and Junior Achievement Academy of Central Florida and was the 2017 Co-Chairman of the Orlando Economic Partnership. He is wholly committed to Central Florida’s continued development both economically and culturally. Coastal Construction Group and the Murphy family have been building projects throughout Florida for more than five decades and have earned a reputation as one of the leading contractors in the state and the Southeast. Coastal currently has operations in Miami, Palm Beach, Orlando, Naples, Tampa and the Florida Keys, and has significant experience in commercial, hospitality, single and multi-family residential, educational, government-related facilities and disaster recovery projects. Coastal has built more than 50 hotels and resorts in Florida, including the Ocean Reef Club, Deering Bay Yacht and Country Club, Boca Grande, Fisher Island Club, St. Regis Resort & Residences, Bal Harbour, the Miami Beach Edition, The Ritz Carlton South Beach, SLS Miami Beach Hotel, Four Seasons, Faena Hotel, as well as numerous South Florida condominiums, office buildings and schools, such as the Mansions at Acqualina, Porsche Design Tower, Residences by Armani Casa, and the Bacardi World Headquarters. Coastal expanded to Central and North Florida in mid-2017 with DeMartino at the helm of its growth strategy in this market.